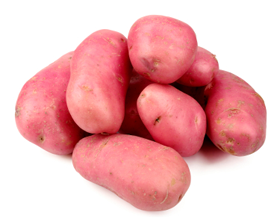 One of the best commercial sort of potato with red-pink skin and white flash. Potato Red Fruit has delisioce taste and will be perfect for frying and baking. Vines yield very well and roots keep a long time when stored in a cool dry place. Sow seed in March/April 0,3-0,5cm deep in pots or trays of good seed compost. Place in a propagator or sealed container inside a polythene bag and place at 18-22C, germination takes 8-12 days. At the end of May-beginning of April seedlings can be sown outdoors. Sow in 70х20cm apart, keeping 2-4 leaves above soil. Harvest potatoes at the end of August-September.